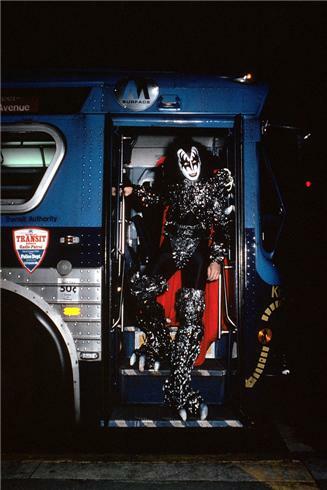 Gene Simmons. We were doing a late-night session at my New York studio on East Sixty-First Street. I had an idea about Gene being like a statue, a work of art, and that we should make a photograph at the Metropolitan Museum of Art. He said he’d like to, but he had already let his driver go and could we plan it for another time. I knew that might never happen, so I suggested we take the bus up Madison Avenue to the museum. He agreed. I think we were both surprised that the bus driver, as well as the few people on the bus, had no reaction to him. That’s what I love about New York City!